What’s the perfect meal to accompany tree trimming and to serve as the test subject of a new 50mm f/1.8 camera lens? 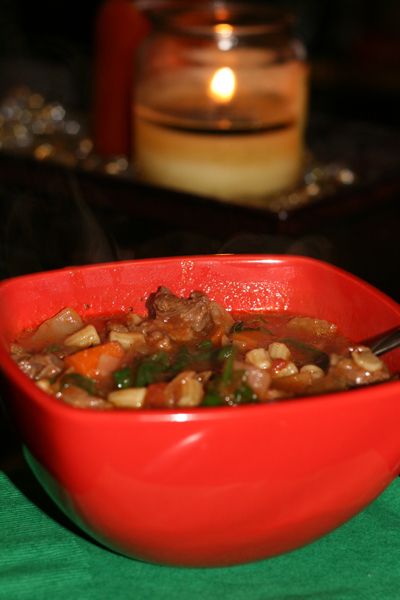 Beef minestrone soup, of course. Smell the savory scent of stewed beef and vegetables while hanging ornaments and sipping White Russians. 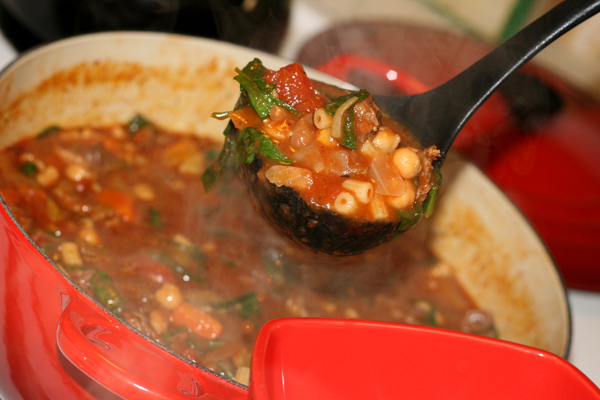 And snap photos of a colorful ladle of steaming goodness. Then enjoy spoonfuls by the side of a loved one in the glow of your Christmas tree. Dust beef with pan searing flour, pat off excess. Heat EVOO in a French oven over medium-high heat. Add beef and sear 10 minutes, or until meat is light brown. Remove beef from French oven, leaving drippings. Add vegetables, season with salt and pepper. Cook 3 minutes. Add beef to vegetables. Add stock, tomatoes, and sauce. Cover, cook 1 hour. Add spinach, stir to blend. Cook 5 minutes. Serve with crusty, garlicky bread, and enjoy by the light of your Christmas tree.